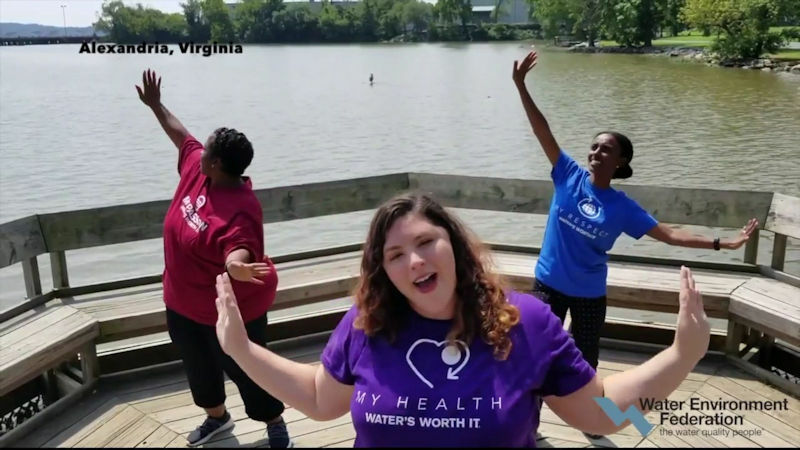 Water Environment Federation (WEF; Alexandria, Va.) staff, from left, Camille Sanders, Jennifer Fulcher, and Ayyaantu Abduselam participate in the One Water #lipsyncchallenge. WEF photo. When the Water Environment Federation (WEF; Alexandria, Va.) received a request to help raise awareness about the value of water on social media, staff responded. In August, the H2duO — Arianne Shipley and Stephanie Zavala — asked water organizations to contribute to a #OneWater lip-sync video. The call for videos, sent during #NationalWaterQualityMonth, asked water professionals to join other public sectors in the #lipsyncchallenge. In another scene of the lip-sync challenge video, WEF staff, from left, Scott Wilson, Fulcher, Kelsey Hurst, and Megan Livak, promote WEFTEC. WEF photo. Recently, the series of social media videos have called attention to public services and public employees, primarily police and firefighters. Shipley and Zavala wanted to highlight water services around the world and the people working to protect and supply this resource to communities. From left, staff members Fulcher, Livak, Hurst, and Wilson showcase WEF’s water sector publications in the lip-sync video. WEF photo.